Three USC Price PhD students from the Price PhD Association hosted a workshop titled “Building Capacity to Engage Differences Constructively” on Jan. 24, providing a safe space for students, faculty and staff to voice and discuss concerns of safety, accessibility to resources, and campus/classroom climate. 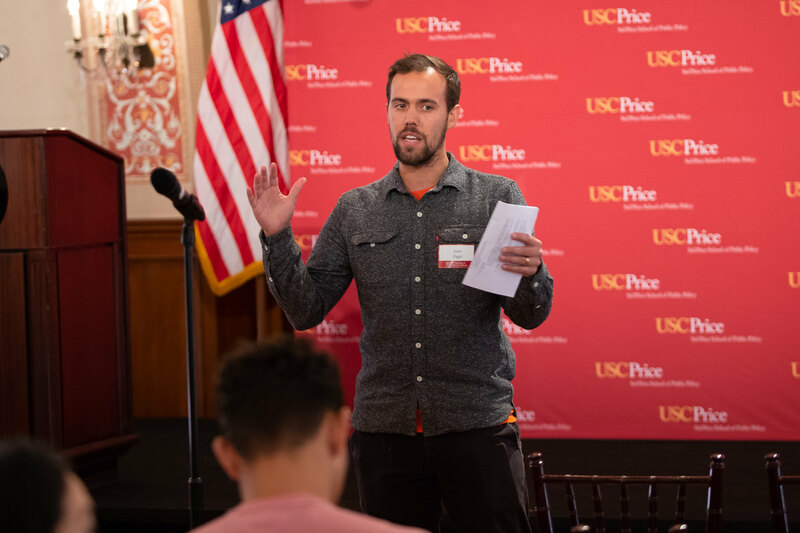 Sean Angst, a PhD student in Public Policy and Management, along with Jocelyn Poe and Marisa Turesky, PhD students in Urban Planning and Development, facilitated the cross-stakeholder discussion. USC Price Dean Jack H. Knott and Vice Dean of Diversity, Equity and Inclusion LaVonna Lewis were among approximately 45 students, staff and faculty who participated in the workshop. Lewis praised the PhD students for answering the call she and Dean Knott put out last semester for the Price School to look inward and use the expertise within the USC Price community to produce a more inclusive school. The PhD students leading the workshop asked participants to answer questions on color-coded Post-it Notes explaining a time they felt their voice was heard or silenced at USC Price, the opportunities or avenues they have used to express issues of difference, additional feedback or reporting mechanisms they would like to see to express differences, and where they go to learn about others. They then entered into conversation circles. First the students talked while faculty and staff listened, then faculty and staff talked while the students listened. The workshop, held at USC’s Town and Gown Ballroom, was a follow up from the “Honest Conversation for Turbulent Times” facilitated by Lorraine Aguilar, Chief Engagement Officer at Working Harmony, who was obtained for the workshop by the office of Dean Knott. The Price Student Organization Coalition, of which the PhD Association is a part, is working on proposed additions to the Inclusive Excellence at Price Plan with a purpose of identifying gaps where improvements can be made. The PhD students plan to take suggestions from this workshop and hold another workshop toward the end of the semester to discuss how to execute these ideas. “Today was a great representation of all the work Dr. LaVonna Lewis has been doing for years and we have been doing as a PhD Association along with master’s students to really take a hard look at the culture at Price and strengthen the diversity and inclusiveness plan to truly make this a safe space for everybody,” Angst said. While acknowledging that there are legitimate reasons why people may have been unable to attend, Lewis about the need for more Price faculty and staff to make an effort to participate in meaningful discussions like this workshop.